This parish church was originally St Mary's chapel, an outpost of All Saints, half a mile away at Little Wenham. But the mother church now sits silent and alone out in the fields, and St Mary is at the heart of one of Suffolk's biggest, busiest villages with more than 3,000 people. Which just goes to show, I suppose, how times change, and how some things remain. This village has no connection with Capel St Andrew, 20 miles away in the marshes. When Suffolk people say Capel, they mean this one. Mortlock found the core of a Norman church here; but, as he says, pretty much all that remains on view is the result of the successive 14th and 15th century rebuildings, making this a grand Perpendicular affair, with Decorated chancel. The church sits above the busy road through the village, and it has cut down over the centuries to leave the church high on a bank above it. However, the uneven churchyard suggests that this may also be the result of imported earth to renew burial grounds, something often attributed to hilltop churches, but actually quite rarely found. St Mary was high in another way, for this was one of the county's Anglo-catholic shrines. 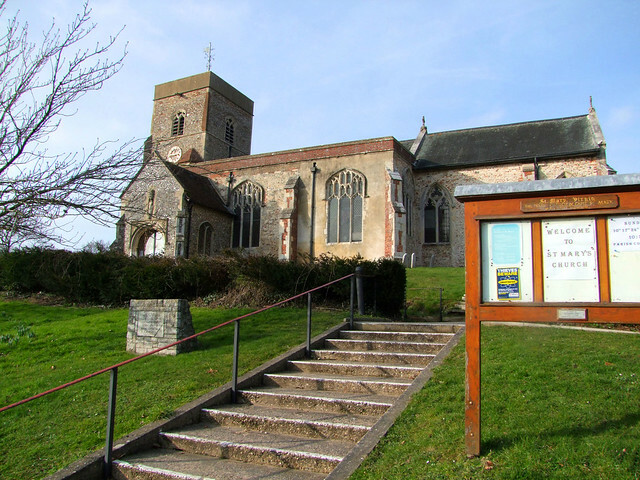 Suffolk is a notoriously Low Church county, but here is a faith community which successfully combined High Church tradition with its role as a centre of Parish life, sacred and profane. The church is open every day. And so, you step inside to a devotional interior. It was clearly much revamped by the Victorians, but has been beautified tenderly since. The west end of the south aisle was cleared to create a wide open baptistery around the font. There is a feeling of light from the great 15th century windows, and of colour from the devotional art that graces the building. The best of these is the window by FC Eden at the east end of the same aisle. 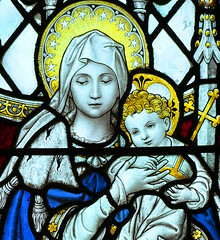 It depicts the Blessed Virgin and child flanked by St Edmund and St Felix, and must count among his best work in the county. The other great star here is the reredos. It is 19th Century, but came from a Belgian church, and has echoes of Flemish tradition. The glass above of the four archangels adds to the sense of gravitas. The statues are colourful without being garish, accentuated by the simplicity of the rural ambience. It all provides an interesting comparison with nearby Stratford St Mary, showing that it was possible for the Victorians to resacramentalise a medieval interior without making it anonymous. Roy Tricker, in his fascinating Suffolk Churches Ancient and Modern, records the successive waves of Anglo-catholic enthusiasm that created this treasure house. The Parish priest for more than forty years from the 1870s was a Father Johnson. His are the angels in the chancel roof, the rood beam and rood with attendant figures, all of which were carved in Oberammergau. He also bought and installed the reredos; when he died, the south aisle was converted into the Chapel of St Edmund in his memory and the Eden glass installed. Father Johnson had also owned a set of Stations of the Cross, but he had not been brave or foolish enough to install them in the church, preparing instead an oratory in the Vicarage. They had an exceptionally fascinating history for Suffolk Anglo-catholic watchers, for they were the very same Stations that had been in the controversial Convent at Claydon in the 1850s. This Convent, under the pastoral oversight of the remarkable George Drury, was on more than one occasion attacked by a mob of furious protestants; you can read more about it on the entries for Claydon and Akenham. His successor, Father Robertson, seeing that the time was right, moved the Stations into the church, where their pedigree added a frisson to their 19th Century sentimentalism. Later, they were replaced with those in the church today by Father Denis Pearce. I wonder what happened to them.